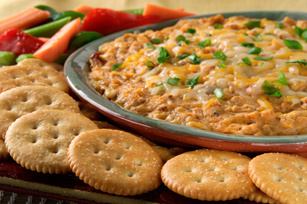 Chickpea dip takes a walk on the spicy side when you add chopped chipotle peppers in adobo sauce to the mix. Mash beans in large bowl. Add cream cheese, sour cream and chipotle peppers; mix well. Remove 1/2 cup of the cheese; refrigerate for later use. Stir remaining cheese into bean mixture. Spread into 1-1/2 qt. casserole sprayed with cooking spray. Bake 20 min. ; sprinkle with reserved cheese. Bake 5 min. or until cheese is melted and dip is heated through. Assemble as directed. Cover and refrigerate up to 24 hours. When ready to serve, uncover and bake as directed. Serve with assorted cut-up vegetables or crackers.